Mrs A McLean - (shown below) weaving tartan on a table top hand loom (used table and floor looms) with Virgin pure NZ wool. Articles such as scarves shawls and cot or crib blankets were woven with 4 or 8 ply or handspun wool. Keep your neck and chest warm on the coldest day. Long scarves are ideal for the clan or family identity on the terraces at the match. Cot/Crib blankets or Christening shawls in your tartan are a unique item likely to become family treasures. These all made wonderful gifts. The weaving was done in Parua Bay, Northland, NZ, and only to order. So if you wanted something in your own clan, sept, family, district or national tartan - an enquiry could once become a reality. * Note: It became increasingly difficult to obtain suitable thread and availability became very restricted. And now with the passing of Mrs. Anne McLean (my mother) the availability of these handwoven masterpieces has ceased. 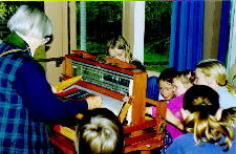 The images show a small table loom in use for demonstration at a school. Have you looked at our Imported tartan fabric and general information pages?